Does anyone know if the class H power supply amps are quality? Do the keep up with say a class a/b with troidial power supplies? 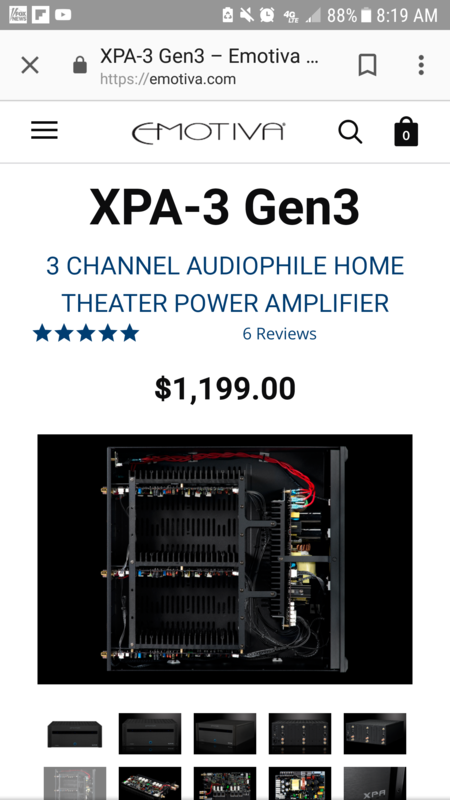 I was looking at the emotiva xpa 2 gen 3 and noticed they did away with the troidial transformer. Looks a little like a class D or is it similar to Carver magnetic field power supply? When i see the words "switching power" used to describe class H i think of Class D.
Class H was a Soundcraftsmen thing, wasn't it? I think it's similar to Hitachi's Class G with two different sets of rail voltages(?). Thanks for the links. I did learn something from them. But more so, i was wondering if anyone knew if they were up to par with traditional power supplies. 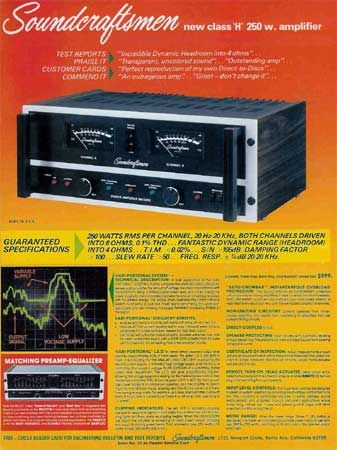 I have been watching #jdjohn post about PS Audio's Class D amp. I for one worked at a shop (ListenUp Audio/ Video in Colorado Springs) that had Rotel and was there when Rotel dove into Class D amps. No one at the shop was sold on it and always doubted the power ratings in such a light weight package. That was 2004 or so. I know much has changed since then. My question was more " are they at least as good as" troiadal power supply amps? I think im going to keep my Parasound 2250 v2 for a sub amp (750x1) on a Dayton Audio Ultimax 15 or other 18 inch sub and buy something else to power the RTA12B mains. Emotiva amps are traditional Class A/B *amplifier* boards connected to a more efficient Class H *power supply*. They still use toroidal transformers, they still use storage capacitors in large quantities to maintain power over large transient swings but they don't suffer from the inefficiencies present in more traditional power supply configurations. Terrible picture but here is the transformer for an XPA-2 while you can see the bank of power supply capacitors in the background. One thing that is most assuredly not lacking on Emotiva amps is their power supplies. They are on par with many of the other names bandied about around here such as Parasound, Adcom, Bryston, etc. From what i can tell, none of the gen 3 xpas have a troidial transformer. Looks like class h does not need them. I think the xpa 2 you show in your pic is a gen 1 or 2. My impression was that they used linear power supplies - but I dunno. As to the issue of weight & power, the wild card is efficiency. A lot of the reason that such massive linear supplies are (were) required for normal consumer AC equipment with moderate/high power requirements was the choice of 60 Hz as the power line frequency. If the standard were, say, 400 Hz, the size and weight of transformers (and smoothing capacitors or chokes) can be much reduced. US military equipment, at least back in the old days, used 400 Hz AC. Switching supplies --I think! -- leverage this property by regenerating higher frequency AC (or pulsed DC), so that any transformers and filtering components can be much smaller. "digital" amplifiers are likewise much more efficient than traditional linear amplifiers -- although it's worth noting that an amplifier operating in pure Class B can be quite efficient. The "problem" with switch mode power supplies is the high frequency "hash" noise generated by the supply. There is way more AC/RF noise in our environments now than there was, say, 40 years ago -- the implications for this, of course, are a higher bar for shielding, filtering, and isolation. Just because Emo has a lot of caps and big torrid, doesn't mean they are "on par" with other names bandied about. There is a whole lot more to the PS section in an amp than caps and a torrid. I'm not saying they are lacking in and of themselves, but to make the leap they are on par with other well known, well reviewed and well like names is a big leap, especially since the others mentioned are a completely different topology (class A/B vs. Class H or G or D in the Emo's). In general switching type PS (D, G, H topologies) aren't always the best solution, they are a compromise in size, weight and cost. Efficiency and cost reduction is the driver. Certainly adequate. Linear P/S with big-rump chokes is where it's at baby. If you can lift it, it ain't big enough. So i hooked the Parasound back up to my mains (rta12b) and have a new appriciation for its sound and bottom end. I was running them off the Yamaha htr rxa1050 while no slouch its self it just does not compete. Im glad i did not sell the Parasound now. A lot of people claiming the above have little to no experience with the Emotiva brand and are simply parroting what they have seen or read from others. I would happily put my XPR-5 up against any similarly rated Parasound, Adcom, B&K, et al and will even supply the crow that one would be eating. In fact, I went through all of those other brands before deciding to try out Emotiva and have been happy at my decision to move the others along. I am not sure what your problem with me is Brock but you seem to always want to piss on any suggestion I make and in fact seem to go out of your way to poo poo on anything I post that isn't in exact alignment with your own opinions. So before you claim I made a "leap" in my assertion, maybe you should have asked a qualifying question like what did I compare them to before dumping all over my opinion like it was somehow wrong on every level. Shots fired!! We need back up! Man Ryan, you'd think Brock came over and took the lightbulb out of your bathroom and left the plunger in the toilet. I have zero problems with you. Just sayin' it how I feel. I didn't even really look at who wrote what I was commenting on. I was commenting in the thread not to you personally. Great, glad it worked for you, we all have our own nirvana we are searching for. My comment was in general, there are certainly exceptions, but in general. That's how I feel and I'm sorry you took it on a personal level. it wasn't meant that way at all. We have opposing opinions, no one peed in your Cherrio's, hence I think you are overreacting a tiny bit (again my opinion). My comments weren't made to denigrate you, they were made to the OP. It appears he agrees at this juncture. P.S. You never went into any detail in your original post about the process or gear you tried. I am not a mind reader, so to throw that in the argument now as a way to defend against what I said is kind of silly. I didn't even quote you or mention your name and you're jumping down my throat? Maybe you have a chip on your shoulder and are just looking for an argument? Don't direct your chipped shoulder at me. Also my general opinion about Emo gear has been steadfastly consistent over the years so not sure if you were having a bad day or what................but no one was out to bash you. Calling something "adequate" hardly equates to bashing. Soundcraftsmen's were Class H amplifiers and had a tubey sound quality to them; at least in the A5002 and twin PM840's I owned years ago. If you weren't dumping on my post then it was an oddly inconvenient coincidence that you used my exact wording in your reply. I see the chip is well attached. Again, I wasn't trying to attack you personally in any way. When I responded I was responding to the text in the post not the person behind the post. When you first posted your displeasure, I was like What?. I had to go back a re-read the thread to figure out why you were so vitriolic. I would have responded exactly the same to any one who stated what you did. No intention of singling you out. That's all I'm saying in this thread. You analyze it, and come up with your own conclusion, as you seem to think I somehow dumped on you. I know now you're saying your post, before I was supposedly attacking you personally. Emotiva started life by rebadging a Carver Digital(Phoenix Gold) class H 5 channel HT amp, and much of their tech comes from that amp and from taking bits and pieces from other designs. Not saying at all that they are not a good amp for what they offer, but Parasound they are not. Just so everyone knows, i only brought up the Emotiva because its the first time ive seen a class h power supply. As i was looking at the emotiva amps i noticed some were missing the huge transformer. Am i correct to say that it is still a class ab amp? Just a different power supply right? If so, i was only wondering if the class h power supply had any benifits like a lower noise floor or if the bass was as punchy ect. The amplifier boards are still indeed A/B on most of their current offerings. But they use a class H power supply to address efficiency losses inherent with class A/B power supply designs. The class H power supply has a high and a low voltage section that it switches between depending on the power demands at a given time. Simplified, to be sure, but that's the gist of it. John, you are welcome any time and I will happily A vs B my XPR-5 against my buddy's A-51. He had the same view you did until we did that comparison because his only previous experience with Emotiva was with their UPA series amps. Decent but definitely not XPRs. And they were noisy (noise floor). The XPR is dead silent, has GOBs of overhead and will surprise even the most adamant Anti-Emotiva advocate. They have come a LONG way from the Phoenix Gold OEM days. My XPR has Nichicon and Rubycon capacitors throughout. The quality of the components being used has improved a lot. A well designed standard power section will be better than most class H offerings. Class H is for economy of size and cost savings. Less parts, less weight, more cost effective parts = economy. It's a compromise vs. a well designed power supply section. Audio is full of compromises. Class A/B is compromise vs. Class A, doesn't mean A/B sounds poor, etc. Not judging good or bad just relating why it's used. That's not to say there aren't some economy standard PS sections in gear. It goes both ways to a point. When care is taken and cost is not spared, a standard PS section is better than Class H switching supply's. The downside is heft and cost of the former. It's kind of a variable rail class AB amplifier topology, somewhat more sophisticated/subtle than Hitachi's "Class G". The amplifier is considered "Class H" (a moniker which was invented, AFAIK, by Soundcraftsmen). The power supply design enables the "Class H" operation. "Class G" had a power supply with two rails and could "instantaneously" switch to the higher rail to give a little added headroom when needed. "Class H" kind of lets the rail voltage slide on up when required, in "real time". I wouldn't say that the Soundcraftsmen amps sounded "tubey" at all -- my recollection of them is that they were kinda brittle sounding... like they were workin' hard at doing their jobs. It's been decades since I heard one, though. To show I am not here just to claim you are picking on me, this is the kind of discussion I was hoping for. In general, you are correct but class H power supplies can be built with efficiency as the primary concern but cost and size being thrown by the wayside to minimize the quality impact. The XPR uses a class H power supply but the toroid is massive and Nichicon caps are used throughout. If it wasn't racked (and a bit hard to unrack at 100+lbs and solo heh), I would get you some close up shots of the power supply. It is impressively built. It definitely isn't a class H from an old Crown pro amp to be sure. The same argument you make for a standard power supply can be made for this particular Class H example. Care was taken and cost was not spared and it shows not only in its performance but also in the heft and quality of assembly. ZLTFUL, what gen XPA do you have? I ask because i think all the gen 1 and gen 2 are regular troidal power supplies. I think only the gen 3 gear use the Class H power supply and therefore would NOT need have a troidal PS. Also i think if it weighs 100+ lbs than you have that massive troidal transformer and therfore would be a class AB PS. Or am i totally wrong??? In this pic i see the power wires (in red) lead strait to a board and not a transformer. I have an XPR-5 and it has a massive toroidal transformer. In a cursory glance of several XPR and XPA model manuals, it looks like they heavily favor class H even with toroids and high secondary capacitance ratings. That's the power supply board. The transformer, while small, is the yellow object right center of the picture.